Seeing his performance and seeing his machine, and the kind of engine junky I am, I got very eager to know the Chris Phieffer methods of biking. By Chris Phieffer methods I mean, why he chose only the BMW F800R for his purpose, what mods did he do etc etc. Chris Phieffer is really an sketch artist, with the tarmac his canvas and his bike his pencil, and his pencil of choice is the BMW F800R. 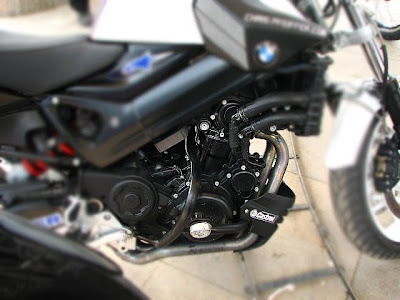 The heart of the entire package is the Liquid Cooled, 798cc, 4 valve Parallel Twin Engine which specially designed to provide impressive pulling power, immaculate throttle response and low level of fuel consumption. The engine cannot be said to be a highly short stroke with the bore:stroke ratio being 82.0:75.6 mm, but it's designed to quickly increase engine rpms, building 90% of the max achievable torque at just 5K rmpm. This has been done specifically keeping in mind the kind of gravity defying stunts Chris has designed for himself to perform. Between 5K rpm and 8K rpm the engine provides it's entire bandwidth of power delivery. Talking of Power Delivery, the max power output of the 798cc engine is 87 bhp @ 8K rpms and 86Nm Torque @ 6K rpms. So, this almost 1:1 Power:Torque ratio is what makes this specially designed bike so apt for someone like Chris to do those jaw dropping stunts all effortlessly pulled at such low speeds and mostly in 1st gear. A fully filled F800R weighs 199kg. In order to match with the special dynamics Chris puts the bike to, the chassis and gear ratios are specially sprint oriented to amalgamate with the performance driven alloy bridge frame and dual rear wheel swing arm. 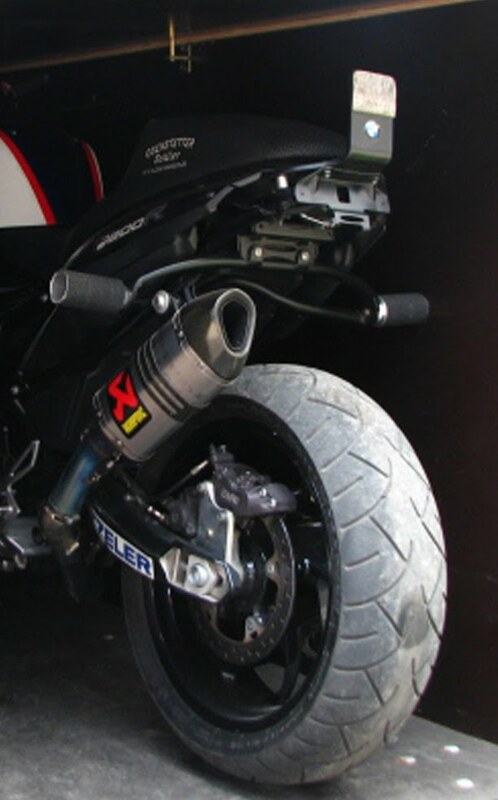 To make the bike even more lighter, the bike is fitted with Akrapovic Carbon Fiber Exhaust Slip ons and various other Carbon Fiber parts where ever possible. Apart from the default features that BMW, Chris has added Front wheel foot rest, Enlarged Rear sets and the Tail section foot rest to help him move the bike in the desired direction in the desired way. Apart from these additional foot rests, the most important mod done on the bike is the Rear sprocket !! This super huge rear sprocket along with the ultra peppy and zippy engine allow Chris to pull the bike up at such low speeds and with in such small distances. 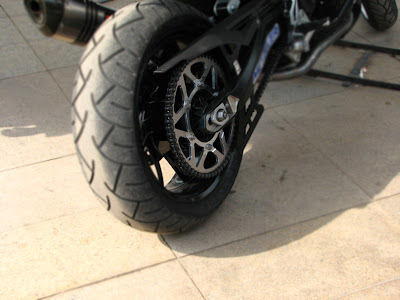 This big rear sprocket also helps in reducing the load on the clutch because of the stunts being performed, else in the stock mode, the genre of stunts that Chris performs, would have proved devastating for the clutch. But at the end, I would say, no matter how good or bad your machine is.... it finally boils down to the Man!! The Legendary Chris Pheiffer!! 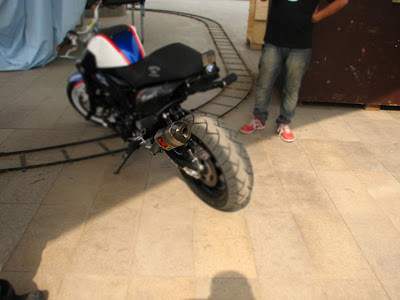 BMW had even honoured Chris by launching a "Chris Pfeiffer" Limited Edition BMW F800R bikes..! !